The US could save $234 million per year, says Suvir Mirchandani. WASHINGTON, DC: A 14-year-old Indian origin boy is making headlines across the nation for his incredibly simple economic proposal that could save the US government hundreds of millions of dollars per year. Suvir Mirchandani, a middle schooler from Pittsburgh, discovered that simply by switching the font used on printouts, his school district could reduce its consumption of ink by 24%, thus saving themselves as much as $21,000 each year without having to buy as many ink cartridges. 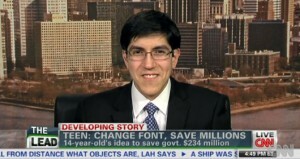 The font Mirchandani says is the most cost-effective? Garamond. Ever since sixth grade, Mirchandani noticed that he was constantly getting handouts for tests, assignments, lessons, and so on. Knowing that using up so much paper was wasteful – if just one student is getting so many sheets, extrapolate it for an entire class, school, or school district – he became determined to find a way to cut back on all the printing. He discovered that the school district had already thought of such things, but the best they could come up with was to do double-sided printing as much as possible, and to implement a strict recycling policy. But those measures would only go so far – the purchasing of ink on a nearly constant basis was still an incredible financial hurdle. In fact, according to an interview Mirchandani gave to CNN, French perfume costs only half as much as ink when compared by volume. A specific bottle of Chanel No. 5 costs less than $40, while a cartridge of ink the exact same size can cost upwards of $75. Mirchandani began analyzing the words printed on these handouts, and found the most commonly used letters: e, t, a, o, r. He then took each of these and printed them with four different, commonly used fonts: Times New Roman, Century Gothic, Comic Sans MS, and Garamond. Then, using a software called APFill ® Ink Coverage, he could find out how much ink was used to create each letter on a piece of paper. By enlarging each letter, in each font, on a piece of paper, it became clear to Mirchandani that the thinner Garamond font was obviously using the least amount of ink. The fact that it’s so much thinner means it uses significantly less ink, which ultimately saves money in the long run. Saving $21,000 for a school district is one thing, however. Taking the same principle and applying it to an entire nation, Mirchandani realized that the US could save as much as $234 million annually by switching to this practice, a sizeable chunk out of the nation’s $1.8 billion yearly printing expenditure. The federal government alone would save about $136 million off of the $467 million it spends on Ink every year, according to the General Services Administration. So far, the government has not said whether or not they’ll definitively implement Mirchandani’s proposal, but they are apparently looking into it. Gary Somerset, the media and public relations manager for the Government Printing Office, has been quoted as saying that the boy’s work was “remarkable,” but could not say if it would actually be put to use.